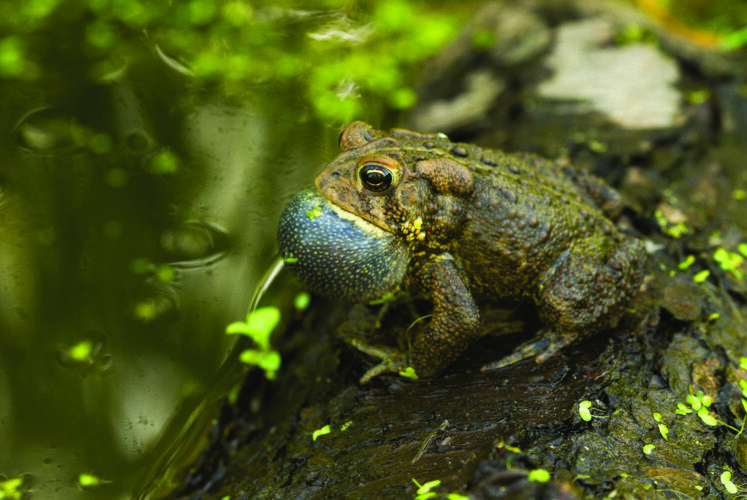 Hearing frog calls is an enjoyable spring pastime in Wisconsin’s wetlands. Here are six frog species to look for in Wisconsin, with ID tips from Dreux Watermolen of the Wisconsin Department of Natural Resources. Easily heard but often difficult to locate, chorus frogs are the first to call in spring. Look for them in marshes, wet prairies, and river-bottom forests. Grassy clumps near the water’s edge provide favored calling spots. 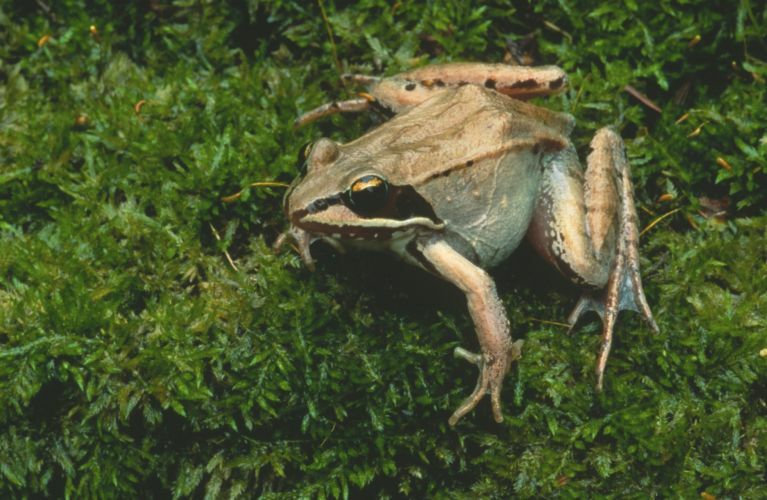 Three brownish stripes run lengthwise along the chorus frog’s body. An additional dark stripe extends from the nostril through the eye to the rear legs. A white line runs along the lip just under this latter stripe. Hear their call. The highly adaptable American toad breeds in habitats ranging from roadside ditches to shallow marshes. Look for them around forested ponds as well as in open areas, including urban backyards. They can be recognized by their dry, bumpy skin and the large glands found behind the eyes. Each scattered dark spot encircles 1-3 “warts.” Hear their call. 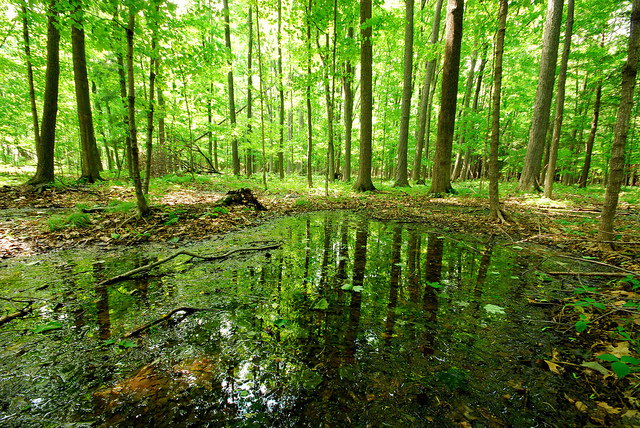 Wood frogs breed in ephemeral ponds in wooded areas shortly after frost-out. You’ll only hear their duck-like quacks for a couple of weeks; they have the shortest breeding season of all Wisconsin frogs. 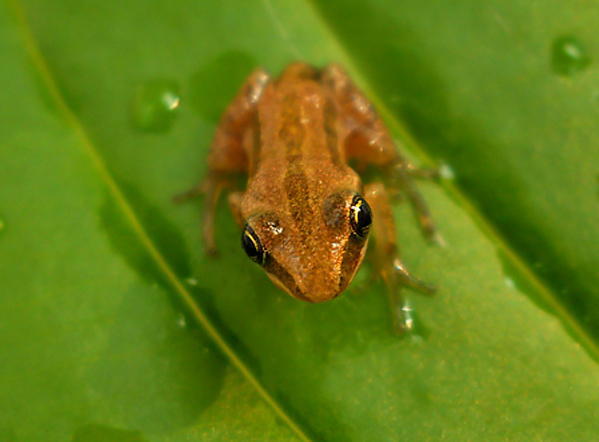 A dark brown “mask” and white line along the upper lip distinguish these small frogs from other species. Hear their call. 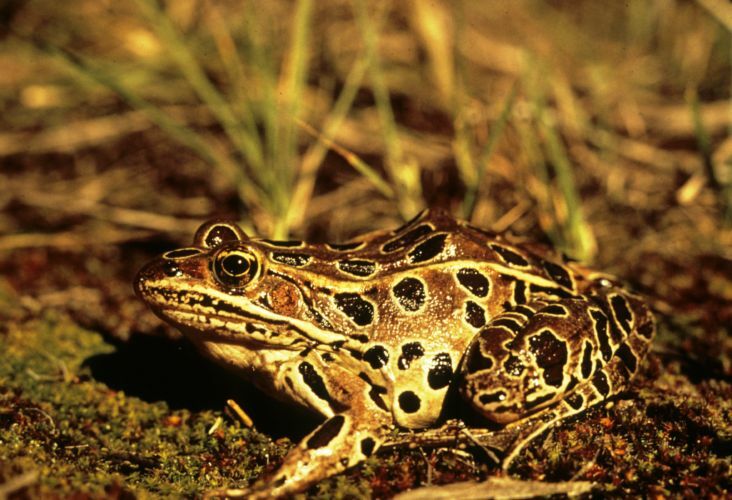 Commonly encountered and easily recognized, leopard frogs will breed in almost any wetland type, as long as predatory fish are absent. Following the breeding season, adults can venture far from water. You may find them in farm fields and suburban parks. 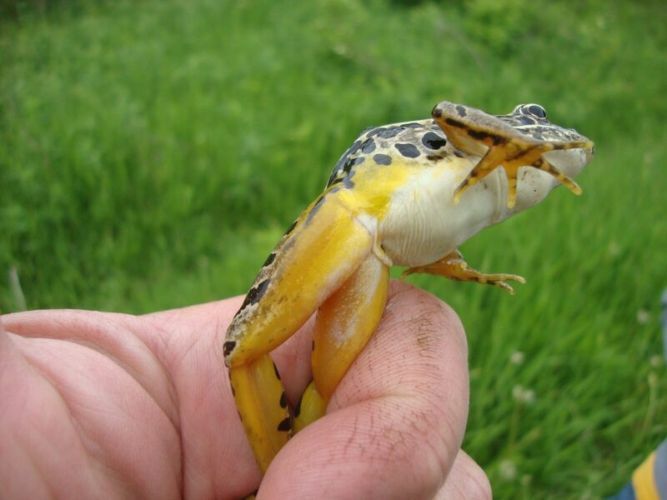 Rounded dark spots outlined in yellow separate leopard frogs from similar species. Hear their call. Adult pickerel frogs seem to prefer cold springs and trout streams, but they often breed in adjacent wetlands, particularly shallow permanent and semi-permanent warm waters. Identify them by their paired rows of squarish brown spots and a bright yellow or yellow-orange groin area. Hear their call. 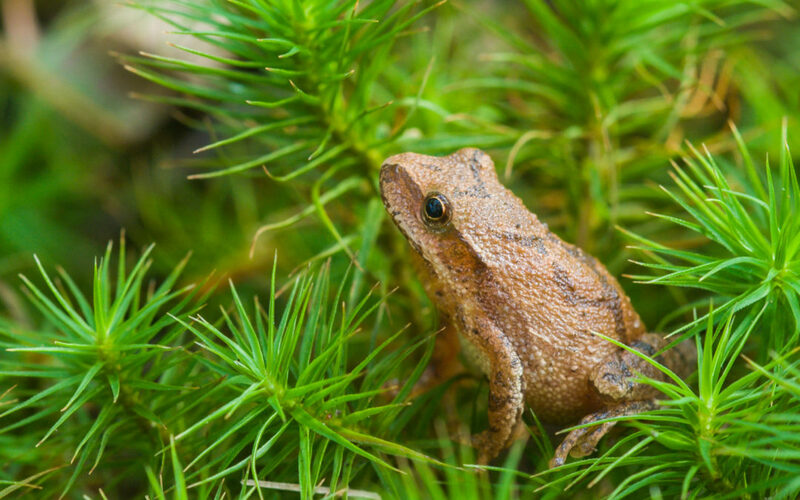 Two species of treefrog call Wisconsin home. 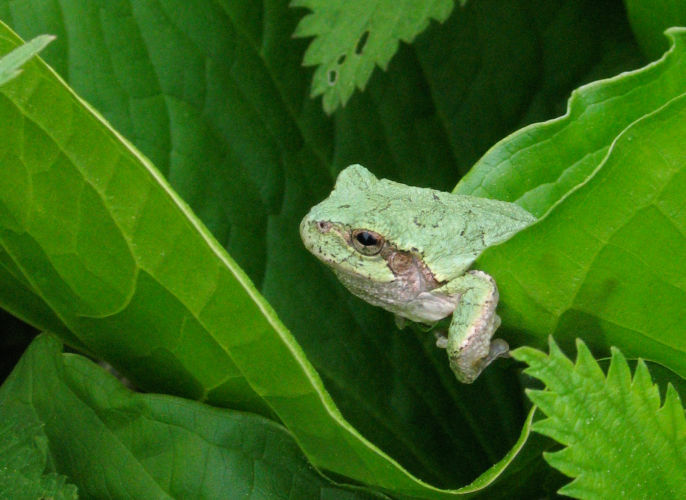 The forest dwelling eastern gray treefrog breeds in semi-permanent and permanent wetlands. Cope’s gray treefrogs hang out along forest edges and in oak savannas, preferring brush over trees. Suction-cup toe pads help distinguish them from most other frogs in our area. Both species can be gray, brown, or green with darker mottling and can change color to better match their surroundings. Hear their calls. How do frogs survive late spring snows? 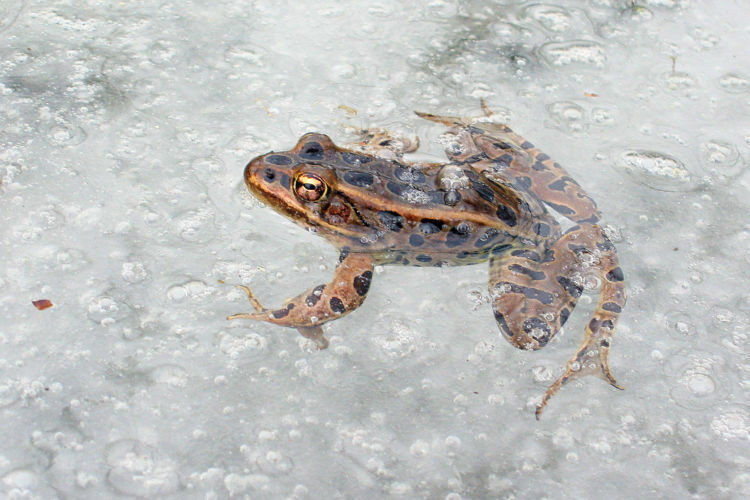 Learn how frogs survive the winter and how long winters may affect them.